Welcome to the Minecart Rapid Transit Wiki! 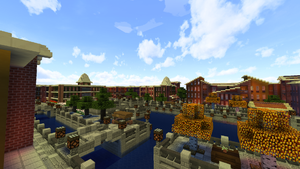 A creative Minecraft 1.13.2 server for transportation and city-building enthusiasts. It has an extensive fully-automated minecart transit system and a few other things. Welcome to the MRT Wiki, where members can write informative pages about their creations on the server, which can include towns, cities, companies, franchises, organizations, transit systems, special events, and more. To create an account on the wiki, you must first become a [Member] of the MRT Server. See the How to Join page on the website on how to become a member. Once you have been approved as a member, ask a staff member for the Wiki Account Creation Password, use it to create an account, and confirm your e-mail address. Initially, you will be able to edit existing pages and create new pages. Once you reach Trustee rank, you may request Trusted privileges from an admin to be able to upload images. For a full list of permissions available to you, please see the Wiki Group Permissions page. Check out the official MRT Events Calendar for upcoming events that are happening on the server. Monte Isola is a European themed town in the Western Ocean of the New World. The town is located on a small sandy island which as it grew, it completely overtook to the point where the original island is now entirely obscured. It is the largest city in its archipelago, and the only Senator ranked town in the area. The town is notable for having no roads, instead opting for a series of canals and footpaths. The town is primarily accessible by sea, but has begun accepting arrivals via Seaplane. Monte Isola, in its nearly three years on the server, has begun to accrue a note long history of various deputy mayors, building sprees, plans/redesigns, and more. News Editor's Hub is being moved to the main page, please use Talk:Main Page to discuss. Progress is ongoing. Reminder Please remember the wiki is a collaborative platform, you do not own pages other than those in your own userspace. Reminder Please do not create placeholder/WIP pages, sufficient content should be added to a new page. News Some low quality (we're talking one sentence) pages will be marked for deletion over the coming weeks. Please see pages pending deletion for pages affected. There will be ample time to discuss these and reverse any decisions. This page was last edited on 17 April 2019, at 00:09.